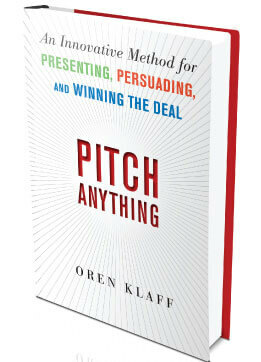 In this post I will summarise a couple of the key concepts found in the book I’m currently reading called “Pitch Anything” by Oren Klaff. The book is fundamentally about how the author pitches high value ($1M-40M) opportunities to investors, but I believe the concepts are applicable across many other areas of human interaction, and this post will be about how they apply to normal sales meetings. One of the main concepts of the book is “situational power”; how to maintain & increase your perceived power when you are dealing with a prospect, to escape the pigeonhole of being “just another sales person”. One of the ideas which is central to your situational power is your “frame”. A frame is a way of looking at the world, an attitude, perspective. Klaff says that any sales interaction becomes a clash of frames, yours versus your prospect’s. What happens inevitably when two frames clash is that the weaker frame is absorbed by the stronger frame. The salesperson is on the prospects home territory (office). The prospect has something that the salesperson needs (a deal, signature, money). The prospect is taking the time out of her busy schedule to see a salesperson. The prospect is a business owner or manager, the salesperson is an employee. The book is full of stories, tips and tricks used to strengthen your frame and dominate the prospect’s, in my opinion the most important point is to be aware that you are engaging in a battle of frames, and to always work towards creating stronger frame than the prospect. Klaff describes the different types of frame attacks you will receive, and the right responses, but there is a simple technique which applies across all of them–namely taking small actions of denial or defiance–while being humorous (so as to not be seen as rude or disrespectful). Doing these kinds of small pokes redefine your frame as being stronger than the prospects, which gets their attention and interest, and opens their mind to you being worth listening to and working with. For example, if you have one of your sales documents on the table and the prospect reaches for it, you playfully pull it back saying “Ah ah ah, we aren’t ready for that, we will be getting there soon!” with a cheeky grin on your face. What you have achieved with this simple act of denial is asserted your authority over the prospect, and strengthened your frame vs theirs! You haven’t been rude, but playful. This subconsciously affects the prospect and shows them that the meeting is being held on YOUR agenda and YOUR terms. You must always be on the lookout for opportunities to perpetrate a small denial like this, purely to increase your power. Another key point from the book is how to deal with the different specific types of frame attack you will receive, including the power frame (“I’m obviously a big shot, who the hell are you”) , the time frame (“we only have 8 minutes for this meeting, please be quick”), and the analyst frame (“let’s study the details, does the data make sense”). The power frame can be busted by using the humeros denial technique described above, the time frame can be busted by you telling the prospect your time is also limited, and wrapping up quicker than expected “wow look at the time, I need to wrap this up to get to my next meeting”. A technique that stood out for me was how to bust an Analyst frame. You know you are encountering an Analyst frame when the prospect starts wanting to talk about details, commissions, specifications etc. If you see this happening, you must immediately take control by saying something like “these are details, and I’m sure they’ll work out–what I’m more concerned about at this stage is should we do business together”, which again asserts your authority, firmly brings the meeting back to the “relationship”, and busts the prospect’s Analyst frame. You also transform the meeting into THEM proving themselves to you, not vice versa. Going in to each sales encounter armed with a few of these techniques and more importantly this mindset is extremely valuable, if you’re involved in any kind of sales or entrepreneurship (where you are generally selling yourself) I highly recommend that you meditate on these points, read the book and try to apply the principles in your interactions.